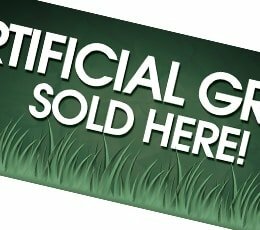 For a small investment of $399.00, SGW will provide you with a custom display stand that will showcase eight of the latest synthetic turf products along with one full color large format banner. In addition to these marketing tools, you will also receive 250 customized tri-fold color brochures about the synthetic grass. We will even discount your first order over $500! Call us today! SGW will provide you with a custom built display stand for your artificial grass. Attract your customers by showcasing up to sixteen of our latest fake grass products. Your customers will have an opportunity to see and feel each synthetic grass product for themselves. After all, seeing is believing! Custom top ad design and faceplates are available. Ask us for details. 250 full color brochures contain all the information your customers will need to know about artificial turf and answers your customer’s frequently asked questions. 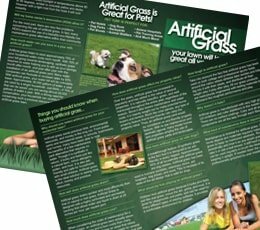 These brochures effectively outline the benefits of artificial grass, maintaining artificial grass, and why your customer should install artificial grass. SGW provides all certified installers with a full color 4 x 10 foot vinyl banner. You will be hard to miss with this hanging on the outside of your business. Let potential customers know who you are and the services you offer from afar!